Rotherham boss Paul Warne is not considering bringing David Ball back from his loan spell at Bradford, despite his shortage of attacking options. 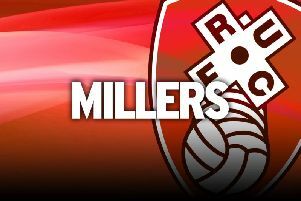 The Millers are scratching around for players at the top end of the pitch, with injuries to Jamie Proctor, Ryan Williams, Joe Newell and Kyle Vassell in recent weeks. Warne has already called Jerry Yates back from his loan spell at Carlisle and he is desperate to enter the transfer market this month to further bolster his squad. Ball, 29, is getting regular action at Valley Parade, where he is due to stay until the end of the season. The former Fleetwood striker was allowed to leave in August after failing to get regular action in the early part of the season at the AESSEAL New York Stadium. Warne could bring him back if he was desperate, but has not forgotten why he was allowed out in the first place. “I just think that I allowed Bally to go because he wasn't playing a lot,” he said. “It happens a lot with players that are injured for a long time, you remember them to be better than what they were, you go, 'Oh I can't wait for them to be back'. “It's like that when you loan players out, but I loaned him out for a reason, because he wasn't in the team then. “I love Bally and he has done really well at Bradford, he is playing every week and he wants to play every week so what has changed? It's not like he is 21, a bit like Jerry, who has come back a bit sharper. With Warne keen to add reinforcements to his squad before the January transfer window shuts, bringing Ball back does not make much sense to the boss. “Would I block that position for someone else, who I think I could get better than in?” he added.